The history of the Quartodecimans has also proven to be valuable as it has helped us to discover the original and true practice of Passover as handed down by Yahushua the messiah and his apostles. What follows is a summary of the evidence presented for inclusion into the Passover debate. 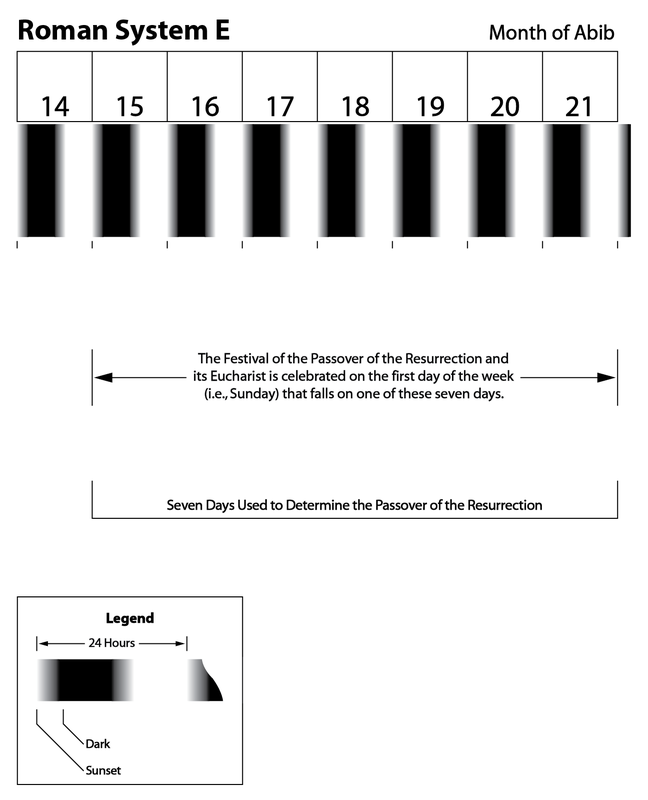 During our investigation we have found seven basic Jewish and Christian constructs for Passover (System A, System B, System C, System D, System E, System F, and System G) along with four constructs for Pentecost. The very fact that there have been so many different ways of understanding what Scriptures have commanded with regard to these festivals and sacred days demonstrates the complexity of the issues. We have also learned that, based upon the qualification found in Joshua, 5:10-12, only two of the four Shabuath, or Pentecost, systems are viable: the Aristocratic and Hasidic. Regarding Pentecost, presently the Orthodox Jews continue the Hasidic method and the mainstream Christians continue the Aristocratic form. 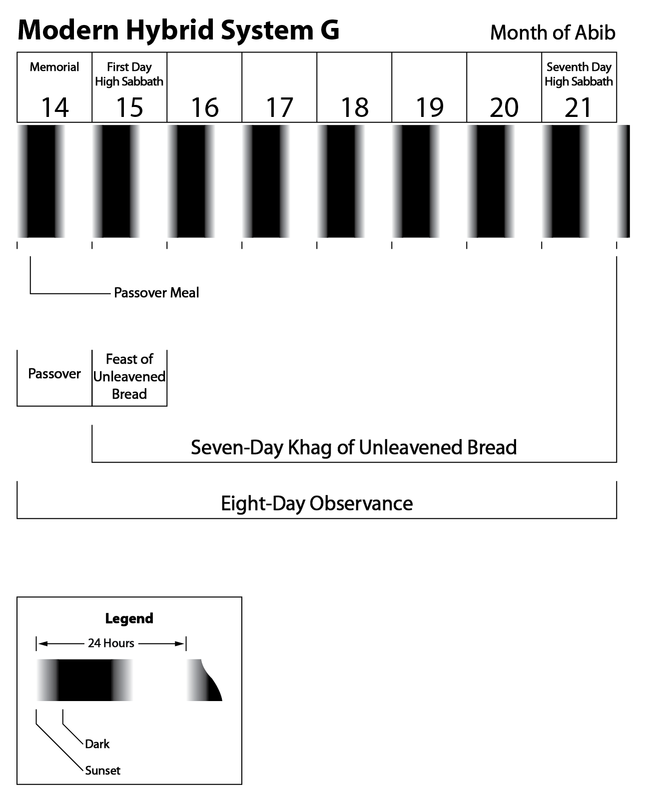 To say the least, based on what we now know and have confirmed per the historical evidence, the issues surrounding Passover and the seven days of Unleavened Bread are more difficult. The two most practiced of the Passover theories are System B, the Jewish reckoning, and System E, the Roman Catholic reckoning which is followed by almost all mainstream Christian groups today. There are very few advocates left for hybrid System C, chiefly because the neo-Samaritans and Karaites are in a state of near extinction. At the same time, System C is in reality only a slight variation of System B and is an obvious attempt to combine the Aristocratic and Hasidic views. Similarly, the old Syrian hybrid, System F, has few if any Christian advocates remaining. It is by-and-large only a variant of System E and, like its Jewish counterpart System C, it is an obvious attempt to mend the breach between System A (advocated by the Quartodecimans) and the Hasidic-based Roman assembly System E.
The only hybrid system having any real following in our present time is System G, which combines the Aristocratic view that the 14th is the date of the true Passover supper and the Hasidic view for the seven days of Unleavened Bread, i.e., from the 15th until the end of the 21st of Abib. Our Passover Series has likewise brought to light the most ancient and important of all the Passover systems—System A, the Aristocratic view. System A, concealed in the pages of history, is yet profound in its far-reaching implications. The evidence proves that it is the oldest system known and was used by the earliest elements of both Judaism and Christianity. It was advocated by the royal Zadokite high priests of Yahweh. They governed the Temple of Yahweh at Jerusalem when the first was built under King Solomon and, again, after it was rebuilt in the late sixth century B.C.E. System A was subsequently continued by the conservative branch of the Zadokites, who formed the Sadducean and Samaritan religious parties. In the second century B.C.E. the family of Zadok lost the high priestship at Jerusalem to the Hasmonaeans, but, due to the Sadducees, who were close allies of the Hasmonaeans, the System A practice continued. It was finally suppressed in Jerusalem by the Pharisees during the early part of the first century C.E. System A was also practiced by the earliest of the Christian assemblies, the Quartodecimans. That the first Christian assemblies would continue the Aristocratic systems for both Passover and Pentecost is not only revealing but points to a heretofore unexplored consideration. Is it possible that System A is the original scriptural practice? Most modern scholars have only noticed System A as a footnote in history. For the most part, they have failed to investigate its true structure and doctrine. Accepting the long-standing victories of the Hasidic System B and System E as a fait accompli, they have passed over any in-depth study of System A. At the time it seemed unnecessary. This neglect is largely based upon the pre-inclination of interested Jewish and Christian scholars to accept the long-standing practices of their own respective groups as original, despite the evidence to the contrary. Yet, it cannot be ignored that System A has all along been the real focal point of opposition for the ancient populist Hasidic systems, such as System B and System E. This historical detail alone should have raised a red flag. Nevertheless, System A answers questions that are otherwise an enigma for the present Christian Passover (System E). For example, Yahushua was under the Torah of Moses at the time that he kept the Passover supper on the 14th of Abib. He also commanded his disciples to keep the Passover with him on that date. Yet, under System E the 14th is supposedly the wrong date for the legal Passover. The problem created by Yahushua’s actions is that if the 14th had been incorrect, then Yahushua, the author of the Torah, would have broken (i.e., sinned against), and caused others to sin against, the very Torah by which he was to receive the Abrahamic inheritance as the seed of Abraham. He would have lost his right to the eternal inheritance. For System E, Yahushua’s actions form an unsolvable paradox. No excuse that the “Last Supper” was a pre-enacted parable can explain his willful act of breaking the Torah by keeping Passover on the wrong date. No matter how one tries to explain it, Yahushua is specifically said to have been under the Torah (Gal. 4:4). Further, he had no power as a man under the Torah to change its conditions. Indeed, once the contract had been made with Abraham, no one, not even Yahweh himself, could change it (Gal. 3:15-17). When one breaks but one point in the Torah of Moses he has broken the entire agreement (James 2:10). The result of such a rebellious act would have rendered Yahushua unable to pass on to others the eternal inheritance via grace. Yet if System A is correct, Yahushua was keeping the true Passover, as the Quartodecimans—and even the quasi-Quartodecimans, like System D—had argued from the beginning days of Christianity. Today, for those followers of Yahweh and their respective assemblies who adhere to the modern System G, they also should have noticed a red flag if and when they had consulted the historical facts. Unfortunately, for the most part, the red flag either has not been noticed or has been actively suppressed and errors have continued to prosper among the many Sacred Name groups of today. Now that the construct of System G has been unmasked, one who is authentically seeking Yahweh’s truth should reconsider the scriptural and historical evidence as it pertains to the most ancient and true practice of Passover and Unleavened Bread: Quartodeciman System A.
Needless to say, this reconsideration along with its ramifications will prove to be rather painful for many. Yet, if reality is to be the criteria for discovering and accepting Yahweh’s truth, then so be it. For those willing to look at the evidence, the reality of the matter reveals that by combining the elements of the false Hasidic Passover (System B) with the elements of the true Aristocratic practice (System A), what has resulted is yet another hybrid and false construct of Passover/Unleavened Bread (System G). It must also be recognize that the material presented in this Passover Series is by no means complete. We have just scratched the surface, so to speak. There are many additional relevant issues to be addressed that will reinforce the ultimate and true conclusion regarding the observance of Passover and Unleavened Bread. 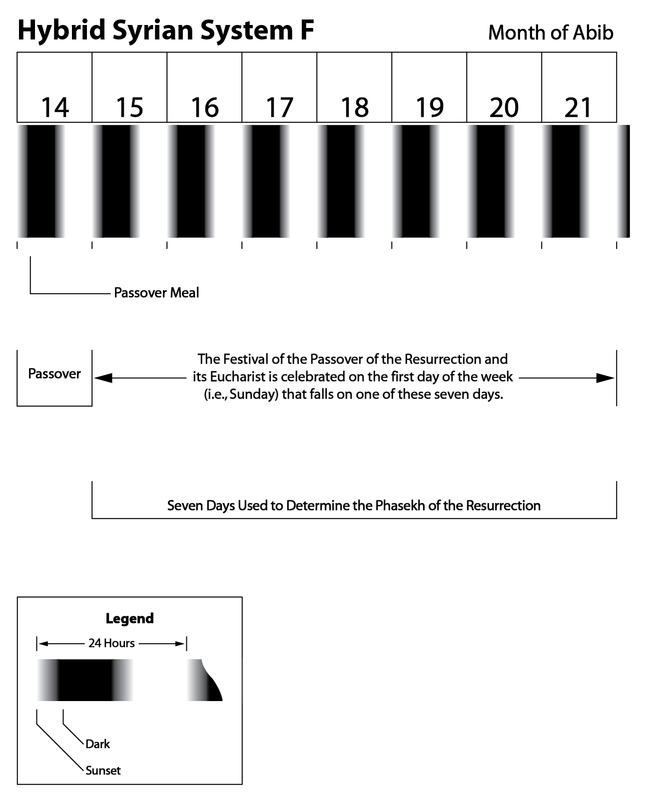 For instance, a vital issue for helping to determine the true construct for the observance of Passover and Unleavened Bread is the comprehension of what part of the day constitutes ערב (arab) and בין הערבים (byn ha-arabim). These Hebrew terms are commonly translated as “evening” and “between the evenings.” The two main interpretations given are the “afternoon” ending the day or “evening” just after sundown which begins the day. Another relevant issue is the accurate historical chronology of Scriptures along with its associated festivals and sacred days and how it can help unlock the mystery of the true practice of Passover. These issues and others will be addressed in future posts to the Passover Series. What we have accomplished so far is to provide the rich history of the earliest Christian assemblies and their struggle to maintain the true practice of Passover and Unleavened Bread as adhered to by Yahushua the messiah and his apostles. Being blinded by a distortion of the facts, many have viewed the Quartodeciman construct (System A) as being no different than the Jewish Hasidic System B, thereby giving affirmation to the flawed Jewish system. This Passover Series has proven that this viewpoint is totally without merit and in reality System A of the Quartodecimans stands in direct opposition to the Jewish Hasidic System B. It is desired that when all of the evidence is fully considered there will be a path available to be taken for a restoration of the true Passover practice of Quartodeciman System A among the many followers of Yahweh and their respective assemblies of today. Also, this Passover Series has been created with the intention of having provided a much-needed voice for the long-forgotten Quartodecimans. The Quartodecimans deserve much admiration for their unwavering adherance to System A as they persevered in resisting the Jewish and Roman factions, whereby they can now be recognized for their being faithful keepers of Yahweh’s true Passover observance. Nevertheless, armed with the evidence at hand, today’s present circumstance demands that, along with the other systems, the validity of the Quartodeciman System A must be thoroughly tested. Only then can Yahweh’s truth be realized. 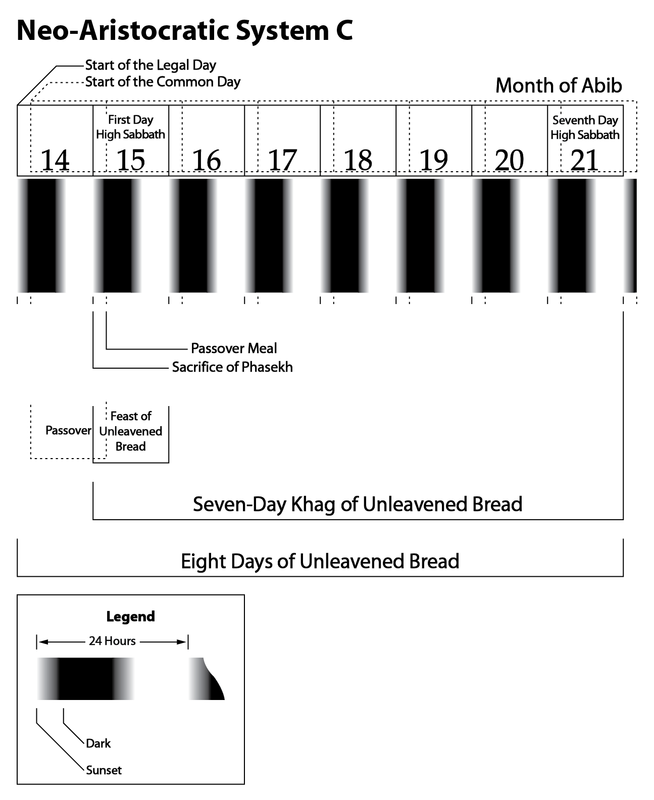 Be sure to continue reading on as we add further posts containing additional evidence for the original 7-day Festival of Passover/Unleavened Bread being Abib 14-20. This entry was posted on 02/20/2013, 11:24 am and is filed under Calendar, Easter, Feast Days, High Sabbaths, Holy Days, Passover, Quartodecimans, Religion, Scriptural Calendar, Unleavened Bread, Vernal Equinox, Yahweh. You can follow any responses to this entry through RSS 2.0. You can leave a response, or trackback from your own site. Great study! I need to read your posts again. I hope this will open up discussions among the various Yahwehist groups. Long live the followers of Yahweh! May He turn and bless them! Great studies, Yahu Ranger. Are you now going to show how it’s done from using the Scriptures? A lot of groundwork has to be established before addressing the hard scriptural evidence proving a 7-day Festival of Passover and Unleavened Bread, Abib 14-20. Most people believe they are already following the guidelines from Scriptures by their observation of Abib 14-21 and have no need to review the instructions from Scriptures again. Therefore, it is the intent of the Passover Series to provide other evidence, namely historical and chronological, in addition to the Scriptures that will hopefully prompt individuals to question their present view of their Passover practice. When the necessary foundation is put into place, the Yahu Ranger can then proceed to lay out the evidence for the true practice of Passover and Unleavened Bread directly from Scriptures.